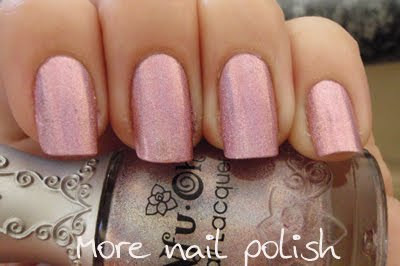 I have deja vous, isn't this the polish I showed yesterday. Well no, this is Nfu Oh #63, which to me is very very similar to #64. 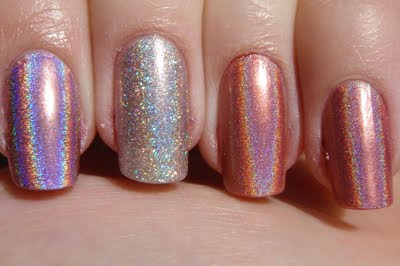 I classify this as a pinky mauve holo, and #64 as a mauvey pink holo. 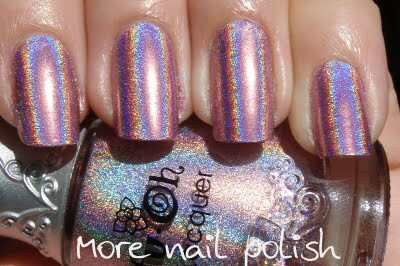 Same deal as the other Nfu Oh holo polish, check out my previous post. This is three coats. Here is this polish indoors. When you compare #63 and #64 indoors, that's where you can see the slight colour difference, with #63 being slightly lighter. Nfu Oh #63, China Glaze Visit me in Prisim, China Glaze TTYL, China Glaze BFF. And the same in sunlight. Visit me in Prisim looks very silver here, but it does have a slight pink tinge. It's a totally different holo polish compared to the Nfu Oh and China Glaze OMG polishes. 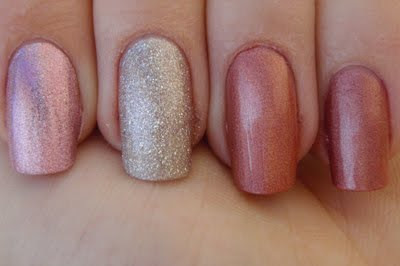 I don't own any of the other CG Kaleidoscope polishes in pink to compare with either sorry. Nfu Oh #63 looks really purple in the sun here compared to the two china glaze holos. mmmmm yummy XP i must get that thing in my stash!